This race came a week after my surprise marathon on the railway path, so I wasn't expecting anything under 13 minutes. My main role in the race was finding and measuring the course - not that a certified 2 miles is really needed but we don't want to race on anything too random (even though we have done in the past!). Taking and calibrating the bike-with-jones-counter was too tricky logistically so I opted for my folding bike and a GPS - a combination I calibrated on our certified "Sri Chinmoy Peace Mile" in Eastville Park. It came out exactly right, amazingly - 1.00 on a single la1% or 2% out so perhaps it was the fact that I was on a bike and carefully sticking to the shortest-possible-route that made it more accurate. On the Saturday afternoon I rode a half mile out along into the Lee Valley Country Park from a lamp sign outside our hostel that made a good start line marker. Fortunately I drew level with a bench at 0.51 miles so that made an easy course - we made that the turnaround point and ran two laps. Sunday morning thirty of us gathered including our fast crew from Dublin and several of us who were still trying to jog the previous week's marathon out of legs that aren't used to racing that distance! I warmed up by jogging to the turnaround point with Tejvan alongside me on the folding bike (several sizes too small for him, a slightly surreal sight) then briefed everyone about the route and handed over to Suswara for the race prayer - I hadn't given him any notice so when he paused for a split second to recall an appropriate aphorism, Sadanand chipped in with one and that began our moment's silence before the start. Premamrita was the man with the stopwatch so he gave us the "on your marks, get set, go!" and off we went. No amount of warmup would have really loosened things up but I was able to at least get above jogging pace and into a decent stride. It soon became obvious that of the Dubliners, only Gianluca was really racing and he went off fast-ish with Suswara in hot pursuit then me in third. Sadanand was training for the Rotterdam Marathon and not about to break out of his schedule for a flat out 2 miler. Everything was a bit tight and hurty but the scenery was lovely, the morning was clear and cool and running with no pressure from my own mind to hit any specific target time was fun. The course was a rough roadway at first (traffic free) and then we turned down a narrower track, also paved, over a narrow wooden footbridge just wide enough for 2 runners to pass and on to the main cycle/walkway alongside the lakes of Lee Valley. There were swans and geese in large numbers, flying over our heads and landing spectacularly on the water. I couldn't catch Suswara but I wasn't losing ground to him either, while no-one was chasing me down, so I kept up the sub-race-pace despite some complaints from my hip flexors and quads which were generating pain for a change (usually it's calves and achilles but they were behaving). It was a bit of a formula one race, everyone staying in position without much overtaking, but we had a great time running in a lovely lakeside world and breathing in the cold, pure air. In the end I was well happy to be third in 13.13. 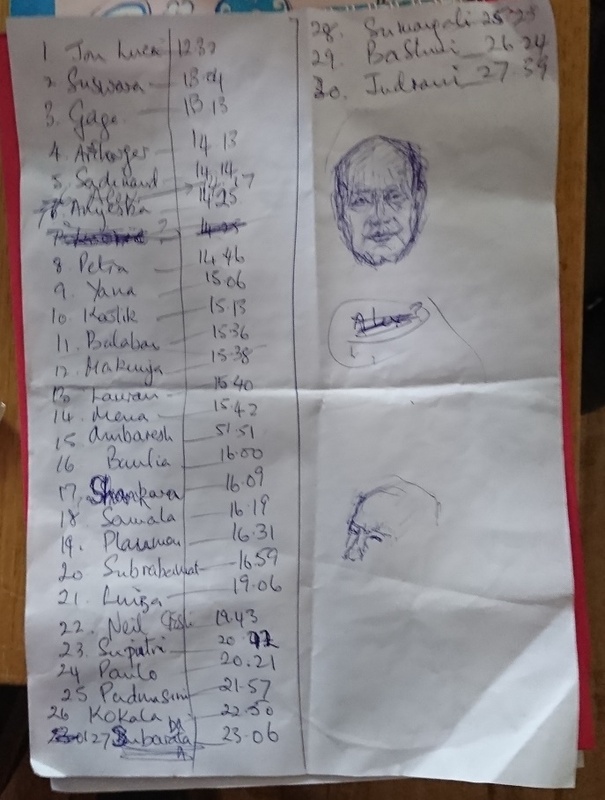 The results sheet was filled in by Kaivalya and includes some of his original artwork - sketches of Sri Chinmoy that he made while waiting for the first runners to come in. Reminiscent of Leonardo's sketches?